We all know that drinking more water and less of other beverages like coffee and soda pop has many healthy benefits for our bodies. Yet, increasing water intake seems to be one of the hardest things for many of us to remember to do. Watermaniac is a free Android app that aims to help people remember to drink more water throughout the day. Watermaniac is a simple app that doesn’t require any kind of registration in order to use it. Simply install the app, enter optional information about yourself (age, gender, and personal goal), and enable the reminders. You can choose the start and end hours of your day and the interval at which you want to be reminded to drink water. 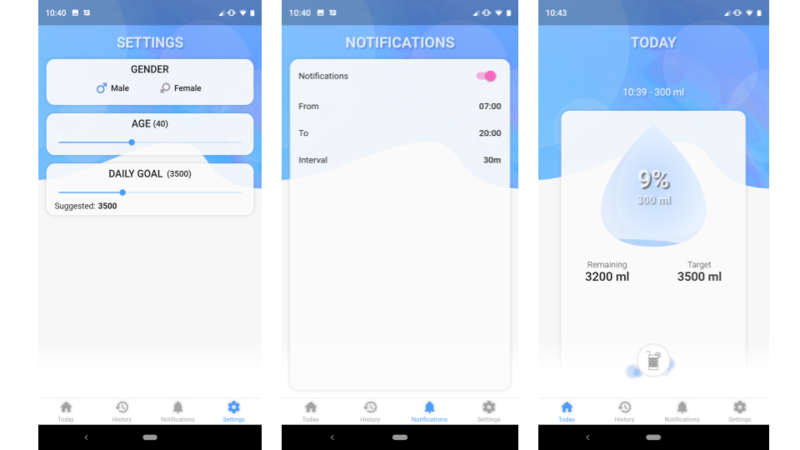 You can use Watermaniac without entering any information about yourself and it will simply default to a goal of 3500ml per day and 30 minute reminder intervals. Once you have Watermaniac running on your phone it will remind you to drink water on the interval schedule you have chosen. You can then log your water intake at every interval. To log intake you simply tap the 200ml, 250ml, or 300ml icon in the app. Your daily intake total will instantly appear and show you your progress toward your daily goal. And if you are thinking that 118 fluid ounces seems like a lot, you’re not alone. I thought it seemed like a lot more than the 8oz 8 times a day that I was taught in high school health class. But according to this PBS Fuel for the Road article, the old rule of thumb of 8×8 is no longer sufficient for many people. I’m guilty of reaching for the coffee pot far more often than the water bottle. But I’m trying to change my ways. Watermaniac just might help me do it.